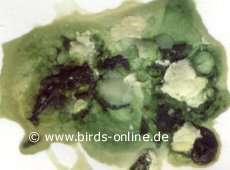 Sometimes birds are suffering from diarrhoea diseases that can be caused by different pathogenic germs or other things. In several cases, the diarrhoea is a sign for a wrong diet. Birds aren't able to digest all sorts of food, especially human food. If a bird for example eats from his owner's plate and gets some food that is indigestive for birds, it may be harming the digestive tract. Depending on the seriousness of the damage to the digestive tract, in particular cases a malnutrition can cause persistent diarrhoea. Only an immediate treatment by an avian vet can prevent the bird from secondary diseases, dehydration, and the loss of electrolytes. Also infections can be responsible for the occurrence of diarrhoea in birds. Such infections are often caused by bacteria, fungi or parasites. They can easily affect birds when their immune system has been weakened before. Typical examples for stress having a bad influence on the immune system are change of the environment or a strong moult. Most of these pathogenic germs can be found in the natural environment and they're not able to harm a bird with an intact immune system. That's the reason why sometimes individuals who belong to a flock suddenly become ill even though their fellows are fine. Typical bacteria from the normal environment are for example E. coli (Escherichia coli) and streptococcus. Also fungi like Candida spp. or parasites like Trichomonas gallinae (Trichomoniasis) can cause diarrhoea. If you think your bird might suffer from any kind of infection, you should meet your avian vet who has to find out which kind of pathogenic germ causes the disease. Regrettably not each drug is suitable due to so-called resistances. That means some special pathogenic germs won't be harmed by the drug. Therefore the vet should take smears from the cloaca or examine a stool sample of the ill bird and get an antibiogram. Among others, severe mental disorders or hormonal disbalances which mainly occur in larger parrots can also cause diarrhoea. One of the symptoms of heavy metal poisonings is bloody diarrhoea. So if you find bloody stool in your bird's cage, you should take the animal to the vet immediately. Intestinal bleedings can kill birds within a few hours! Other possible reasons for diarrhoea are tumours of the inner organs; especially intestinal and kidney tumours often cause bloody stool. If a bird's droppings are wet, not necessarily a diarrhoeal disease is responsible for that. Many pet birds who produce wet droppings suffer from a kidney disease instead. Since stool and urine come from the same place (the cloaca), most people confuse diarrhoea with polyuria. In normal droppings of a budgie, the urine's consistency is creamy and it is coloured white. The dark section of a dropping is the stool and it surrounds the urine. In general, both parts of the droppings are odourless and dry out within a short time. 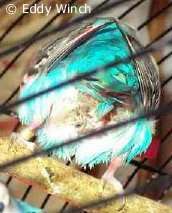 In the photo you can see normal droppings of a budgie. If a bird drinks a lot of water or eats fresh food like fruit or vegetable, a typical effect can be observed: The urine quantity increases. Droppings that contain a lot of urine are quite wet. Therefore such droppings often are confused with real diarrhoea. But if you have a closer look at these droppings, you will see that only the urine section is more liquid than usual. The photo shows a "wet dropping" that occurred after the bird has been eating cucumber. If the droppings remain this wet for longer than one or two hours after the bird has eaten fresh food or has been drinking a lot of water, a kidney disease may be the reason for the wet droppings. You can tell real diarrhoea from wet droppings like shown above if you have a closer look at the stool portion. It is more or less wet, slimy, and sometimes such droppings even smell bad. The urine part is solid and creamy as you can see on the right. Also a change in colour can occur. 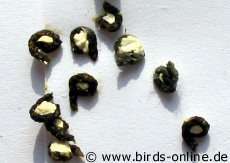 Diarrhoea droppings of a budgie can be greenish, yellowish or even reddish (bloody stool, see above). Often the plumage around the cloaca is wet and stool is sticking to it. It's important to make sure that the cloaca is not constipated by dried diarrhoea. This would be very painful for the bird and could even be deadly. It is necessary to act fast and start an effective treatment as soon as possible. Therefore you should meet your avian vet or little animal vet quickest possible and let him or her find out what may be the reason for the diarrhoea. Waiting for one day or more could be a fatal decision because diarrhoea leads to massive weakness quickly. Birds tend to suffer from dehydration and starvation caused by diarrhoea. Your vet will tell you which drugs you should use and you should comply with the instructions. Please do not arbitrary stop the treatment without discussing this decision with your vet. Else you would risk a (deadly) relapse. Important note: In the literature and on some websites people advice to treat the ill bird with so-called bird coal as a first-aid measure for diarrhoea. You should not follow this advice because it could harm your bird. The bird coal absorbs the liquid inside of the bowel and also soaks up the nutriments from the digested food mash. But the bird coal is not able to kill for example bacteria or fungi. That means the droppings might look fine, but the bird is still ill and also the coal takes away all the nutriments what weakens the feathered patient. As a first-aid supplies, you can use healing earth instead. It doesn't soak up the nutriments, but you should of course go and see your vet as soon as possible since healing earth won't kill any germs that might be responsible for your bird's disease. Please don't forget to ask your vet about any special diet hints.